THE following papers have been read at the Winter Meetings held in Nottingham. By The Rev. A. Du Boulay Hill. East Bridgford Church was fully described in the Transactions of the Thoroton Society, vol. vii, 1903, after the first portion of its restoration, which included extensive preliminaries of lowering the soil and underpinning the foundations, and the restoration of tower and chancel. After an interval of eleven years, the remaining portion of the work, the restoration of the nave and aisles, has at length been completed, and the church was re-opened on May 23rd, 1914. (Plate I.). 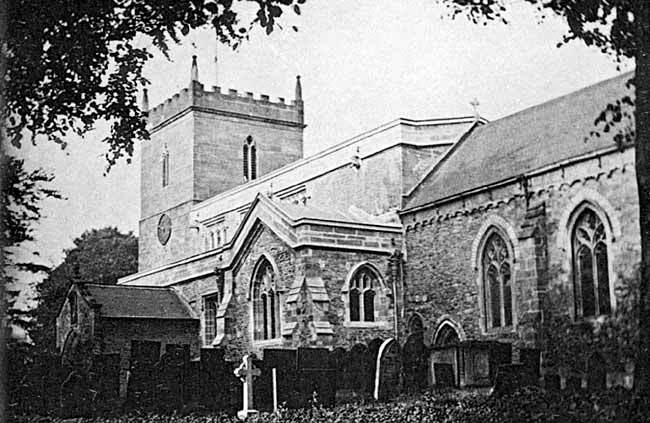 East Bridgford church after restoratiion in 1914. East Bridgford church, nave looking west. 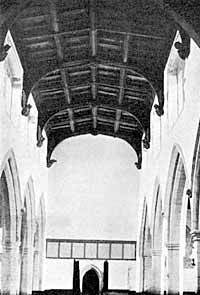 The work that has now been accomplished, under the direction of Mr. C. E. Ponting, F.S.A., Architect, is as follows: A fine new oak roof to nave and aisles, replacing the 18th century roof and plastered ceilings, has been constructed upon the exact lines of the 15th century roof, erected when the clerestory was added. (Plate II.). The main details have been recovered from the old insertions for corbels in the wall, and from one surviving tie-beam which had been used to carry the bell-frame in the tower, and which is now again incorporated in the roof. It has six cambered tie-beam principals, supported on circular braces carried down the walls to oak corbels, on which are finely carved angels with widespread wings, and a bold cornice with a hollow enriched with carvings, among which are two shields bearing the arms of Southwell Diocese, and of Magdalen College, Oxford. It was found necessary to strengthen the eastern angle of the south aisle, as a settlement here had seriously affected the stability of the chancel arch : and so, in accord with indications of the existence of the transept pulled down in 1778, new buttresses have been added here and combined with a transept-wise gable placed upon the eastern bay of the aisle. The external effect of this is excellent, and affords an explanation of the absence of a window in the eastern bay of the clerestory. The clerestory windows, which had been reduced to square openings by being deprived of their original heads, have been supplied with new tracery and mullions. A parapet has been added to both nave and aisles, which have been covered with the old lead, recast on the spot by an interesting revival of an old method. The windows of the south aisle, with one exception west of the porch, are all new, and replace very plain 18th century segmental-arched openings high up in the wall which was built when the transept was destroyed. (Plate III.). In the north aisle three similar segmental-arched windows have been left untouched, preserving the historical link with the 18th century. (Plate IV.). The two westernmost of these windows reveal a curious history, for they clearly retain the jambs and sills of the 14th century. They have lost their mullions, and have been transformed by the addition of segmental stone arches, which in their turn must have replaced flat wooden lintels of some very destructive 17th century repairs. The evidence for this statement is found in the double set of stanchion holes cut in the sills of these two, but absent from the sills of other similar windows inserted in the walling across the transepts and elsewhere, in the 18th century. The same process of double transformation was indicated in the clerestory windows, where the 6ft. openings had four stanchion holes cut in each sill, proving the existence of a long wooden lintel, which in 1778 was replaced by a stone lintel supported by a single mullion. 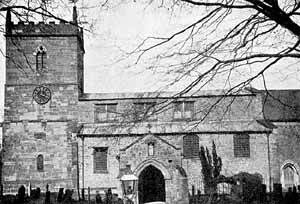 In Thoroton's time (1678) the church was still in its medieval condition, the windows retaining their heraldic glass. The glass must have been destroyed when the mullions were removed and the wooden lintels inserted, probably about 1686, when sad work was done in the chancel. The drastic renovation of the church in 1778, recorded on a stone tablet on the south wall of the tower, (when the tower was rebuilt, the transepts destroyed, the monuments cast out, and nave and aisles re-roofed and ceiled) was at least not responsible for the destruction of all those old windows and their heraldic glass. A brief issued in 1770 for raising funds for this work refers to some considerable expenditure having been previously incurred:—"the parishioners have laid out several sums of money in repairing [the church of East Bridgford] yet the same is become so ruinous that the Tower steeple and great part of the body of the church must be taken down and rebuilt." (Brit. Mus. MS. Ch. Briefs, xi. 2.) It is interesting to have disentangled the operations of the 17th and 18th centuries, though their results have been so deplorable. It may be here mentioned that a stone coign indicating the position of the north transept, and a similar portion of the north respond of the old tower arch, both formerly concealed by plaster, are now visible in the interior of the church. Settlements in both the north and south arcades necessitated the serious work of underpinning and renewal of the bases of three of the pillars, in which several fractures had occurred from the combined effects of bad foundations, and of faulty bedding of the courses of soft Gedling stone. 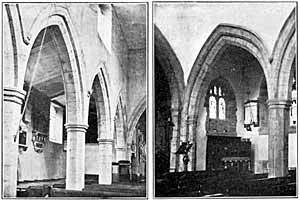 East Bridgford church–north aisle before and after restoration. The interior plaster of the nave and aisles is finished with whitewash, which is so lovely in its tone effects when kept pure, and well sets off the stone dressings and arcades. Two stained glass windows, the work of Mr. H. Bryans, have been placed in the south aisle, at the east end of which a side altar of carved oak has been fitted up. (Plate IV.). Block-flooring has been laid beneath the seats, which have been considerably altered so as to render them comfortable for kneeling as well as sitting, a point too often neglected in church-planning. The six bells have been tuned, and re-hung in a new rigid steel frame.